July 13, 2013, Victoria, BC (ISN) – Friday, the eve of the Rock the Shore outdoor concert, was alumni night at Bear Mountain Arena as the Shamrocks hosted the Langley Thunder in the battle for first place. There were many stars from past seasons in attendance as the Rocks celebrated 64 years of lacrosse but the Shamrocks stars of today definitely didn’t shine as they came out on the losing end of an 11-6 score. Playing the second game in two nights, Matt Vinc got the start for Victoria while big Brody MacDonald got the nod for the Thunder. With all the offensive firepower in both line-ups, the first period was very much a defensive battle. Victoria got on the board first, Tory Gardner tallying off some transition speed at 6:28, grabbing the pass as he exited the penalty box. Langley replied at 7:54 when Shayne Jackson scored on a low shot and they took the lead at 9:12 off a goal from Dan McQuade. That was all the scoring in the opening period with the Shamrocks holding a 15-11 lead in shots on goal. The Rocks took the lead with a pair of quick goals in period 2, Corey Small reaping the benefits of some great work along the boards by Tyler Burton at 2:43. At 3:58 Derek Lowe took a pass in front to make it 3-2 Shamrocks. The wheels fell off after that as Langley scored the next 3, gave up 1 more and completed the sandwich with 2 to finish the period with a 7-4 lead. The Shamrocks were not sharp, passes were being missed and the Langley defense was keeping them outside and making the best of their own speed on transition. The third period didn’t get any better for the home team as they were outscored 4-2, including a Langley goal shorthanded and one on the power play, penalties not playing a huge role in the game. Overall Victoria had a 49-37 edge in shots on goal but they didn’t look sharp, perhaps partly the result of playing two games in two nights. It was definitely a disappointment to the packed house at Bear Mountain Arena. Corey Small and Mitch Jones each had a pair of goals for the Shamrocks with Tory Gardner and Derek Lowe picking up the others. Tyler Burton was possibly one of the better players on the floor playing with great tenacity and picking up a couple of assists from his defensive role. The high-scoring trio of Conway-Shattler-Ranger were held to a total of 4 assists. The result moves Langley into sole possession of first place, two points ahead of Victoria and holding a game in hand which they will make up as part of their weekend on the island as they travel to Nanaimo to face the Timbermen Saturday. It also evens the season series between the two teams at one apiece with the deciding game in Langley next Saturday. In other Friday action, Burnaby handed Coquitlam a 14-10 loss and that moved the Lakers into third place, 2 points back and 2 points ahead of Maple Ridge. 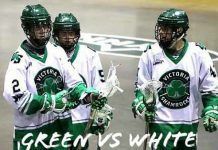 The next action for the Shamrocks will be next Friday as they host the New Westminster Salmonbellies for the first time this season. That series is also even at 1 each so again Victoria looking to win at home. It will be Military Appreciation Night so hoping to see a lot of men and women in uniform to cheer on the home team. Game time is 7:45 pm.